Slimline Pastel Carrier showing padding and inner slotted foam. Upturned lids are pastel trays with padding. Now shipping! 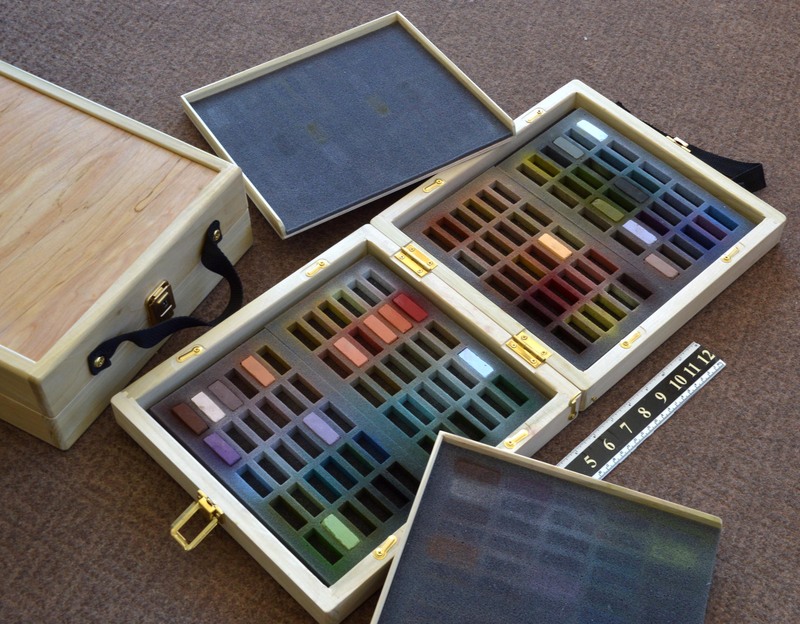 Elegant pastel travel boxes especially designed for Terry Ludwig Pastels. Click on the images to see them full size. Protect your investment. You bought the best pastels money can buy: Terry Ludwig's. Now give them the protection they deserve for safe travel. Whether you're headed around the world for a workshop or just out into the countryside for a morning of plein air painting, your most important tools must get to your destination in great shape and ready to go to work for you. 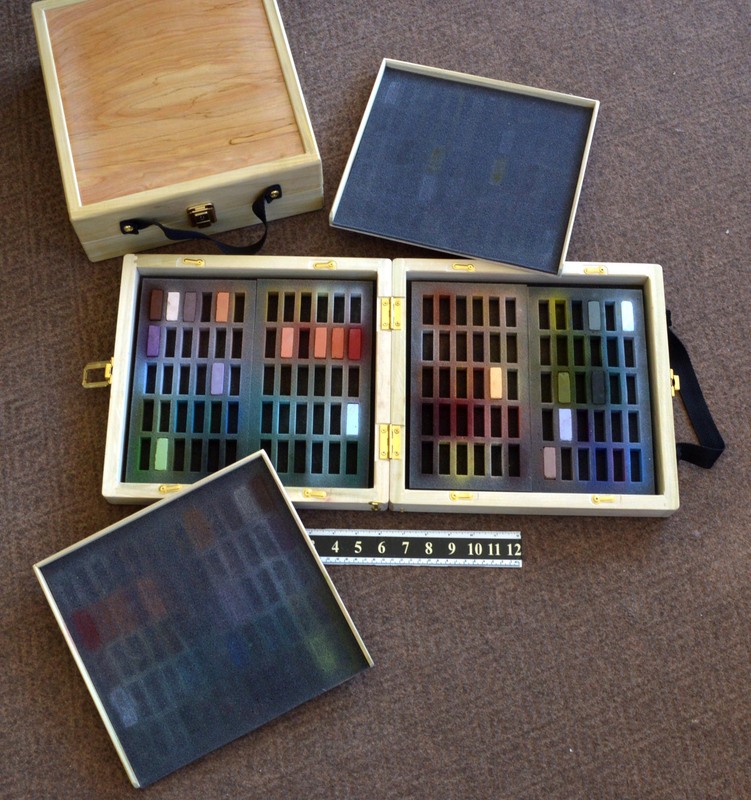 I know there are a lot of pastel artists in the same boat I'm in: We love the texture and colors of Terry Ludwig's square pastel sticks but haven't found a great way to carry them outside the studio. They come to us in cardboard boxes that are somewhat durable but not really sturdy. They have plenty of padding around them so they can travel in those boxes but it's awkward to use them in the field that way. Care must be given to make sure the box lids are on securely and the two box sizes become cumbersome when mixed together. I've tried all sorts of solutions to hold them together, from rubber bands to bungee cords. Commercial pastel boxes by other manufacturers aren't quite the right size to hold Terry's pastels because his are thicker than most sticks. They're no more fragile than most brands of soft pastel but they do need padding between them to protect them from the bumps and grinds of air or highway travel. 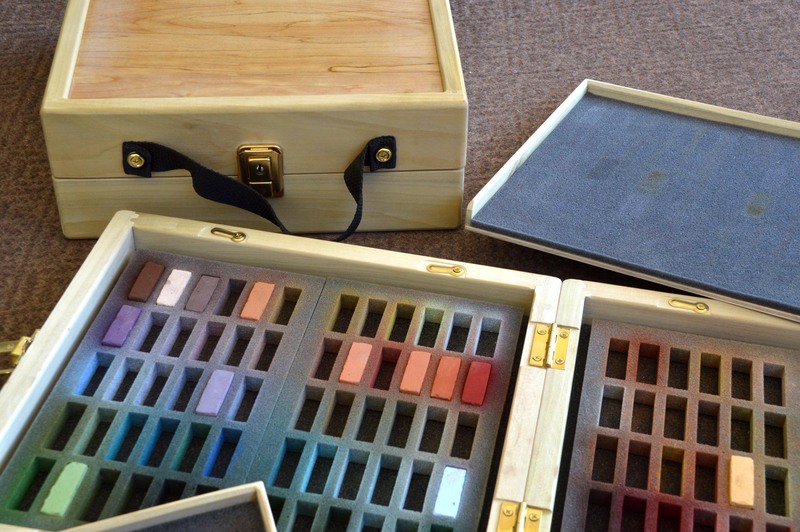 I tried all the solutions I could think of but finally decided the best course was to make my own boxes for Terry's pastels. 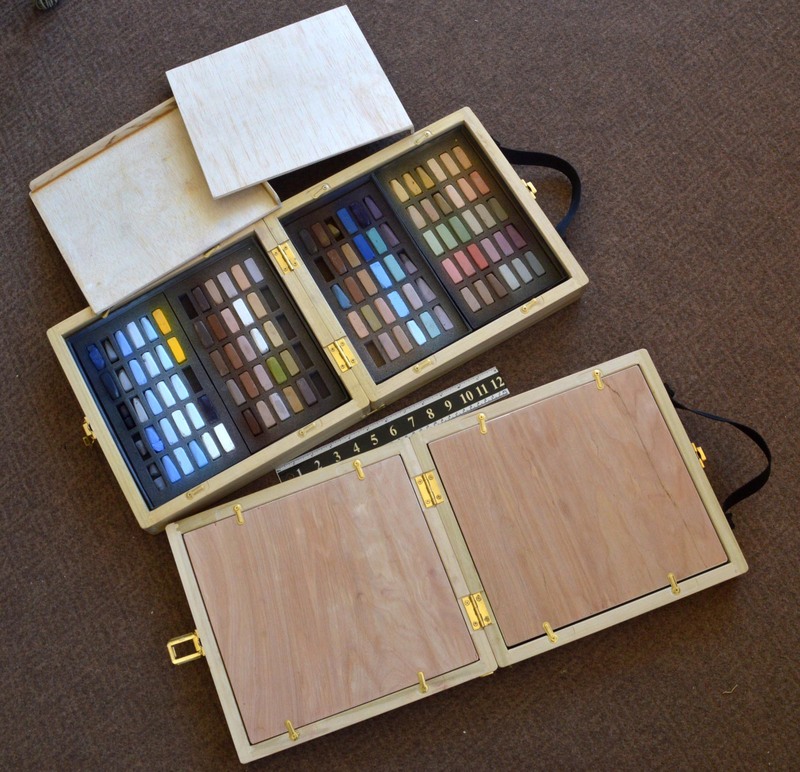 It took a lot of sophisticated woodworking tools and many hours of cutting and fitting, trial and error, to come up with what I think is the perfect Terry Ludwig Pastels portability solution. Actually I arrived at two solutions and I plan to use them both in my own plein air and workshop travel adventures. Convinced that I've solved the problems, I want my friends who love Terry's pastels to get the same benefits. I can only make a limited quantity of these boxes without cutting into my painting time: They're quite labor intensive to make. 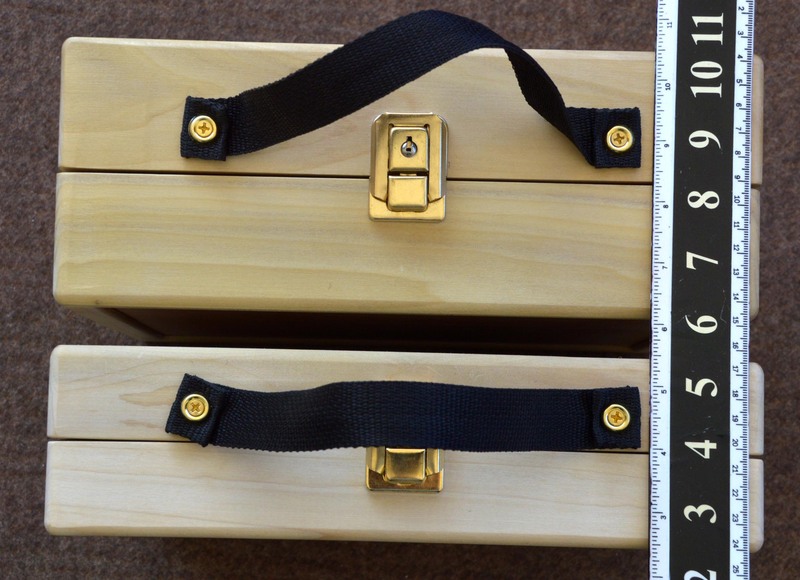 I have two styles available: Box Carrier and Slimline. The Box Carrier style will hold actual Terry Ludwig pastel boxes. Each carrier has two sides which are hinged and fold together. Each side can hold either a full 60 piece set or two 30 piece sets. The Box Carrier will receive the actual Ludwig boxes complete with the three layers of 1/2 inch foam padding that Terry puts in his boxes. The slimline carrier is lighter in weight and thinner for easier transport or backpacking but holds only the inner foam from the Ludwig boxes which has slots to secure the pastels. There is foam padding built into the base and lid of the Slimline boxes to further protect the fragile pastel sticks. It's at least as much padding above and below as you get in a Heilman or Dakota box plus the perfect amount of padding on all around the sticks (Terry designed that part of the padding himself). 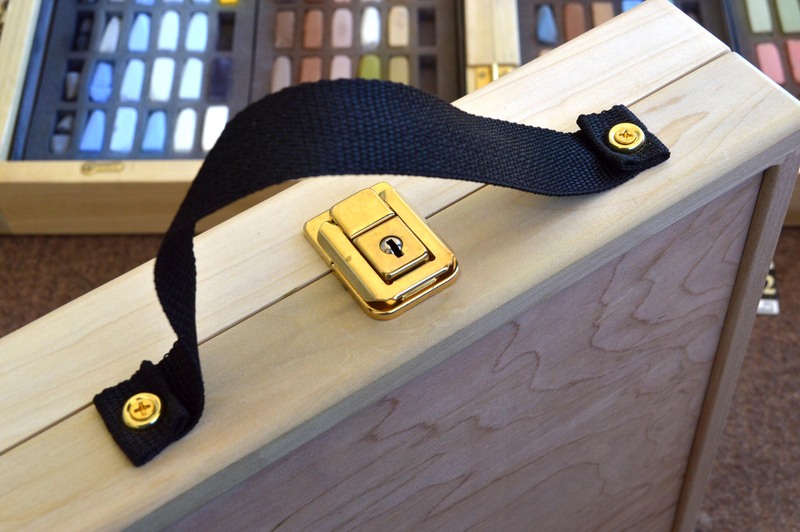 These solid, handsomely crafted boxes can be purchased directly from Gary Huber Fine Art. They're all hand-made on a custom order basis. Both styles available for $175. Order securely through Square marketplace via one of the following links and select your wood type and other options. Since I have upcoming show and gallery commitments I can only get so many boxes done per month and it takes a full two weeks to make a box including all the glue and finish drying time. Your credit card will be charged but I don't get the money until I mark the order as filled which is usually when I ship the finished product to you. And by the way I never see any of your credit card info. 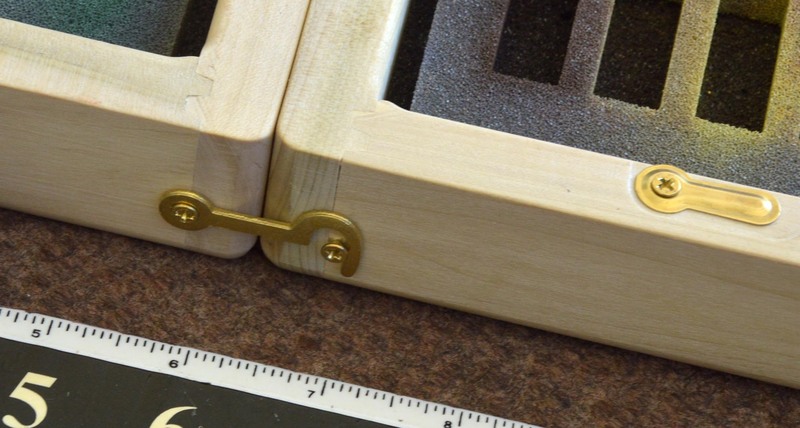 For the winter months I will not be making any boxes due to lack of a heated workshop. You can look at the order pages but they won't let you actually order until spring. Check back in March. Thanks and happy winter! Full box: 4-3/8" x 11-1/2" x 12-3/8"
Slimline: 3" x 11-1/2" x 12-3/8"
Use the Contact page to get in touch with me if you have unanswered questions. Comparison of box style widths. Slimline at bottom, Ludwig Box Carrier at top. Slimline box is awaiting finish coat. Slimline carrier open, Box carrier behind. Slimline Pastel Carrier in foreground, Box Carrier behind. Catch on box to hold box open while painting so it fold up and dump your pastels. Click on images to see larger.